I'd also like to thanks the people that contributed short films and presented prior to the show. (Connor Jackson with CJ kayak gear, Hi-May Rivera, and Scott Doherty with WCKA) As well as the bands that played after the show (The James Thomas Revolution, Cap Gun Suicide, IQEQ, and Bellamy Rose). It was one fun night! 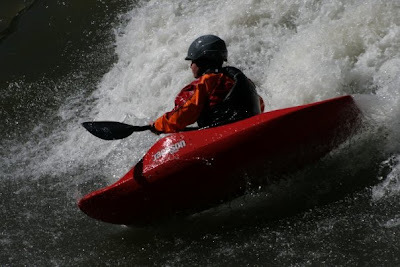 The next morning there were some big plans brewing for a paddling weekend involving the North Fork Payette, Gold Hole, and the Little Salmon Waterfalls. I got kind of a late start on things however as I had to get things wrapped up from the film premiere. 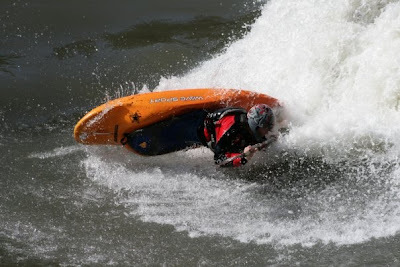 But Scott Doherty with World Class Kayak Academy and local ripper Seth Stonner headed up very early to fire up the Middle 5 on the North Fork logging 15 year old Seth Stonner's first run above 900 cfs with a stout flow of 1800 cfs where he fired up a run of Jakes and styled it. Props to him for sure. Later that afternoon found everyone at Golds Hole surfing it up with nearly ideal flows. The following morning saw a bluebird day so Seth and I headed up the Wind River trail to scout the drops upstream of the standard put in. What we found was drop after drop with small pools in between. We quickly made a plan to head back in and try to navigate the canyon on Tuesday because Seth did not have school that day. After scouting the Wind River, we had a surf session at Golds Hole (wave) and never did get onto the Little Salmon Waterfalls, but we will be there sometime this spring. The exciting thing is that we had a plan set for attempting the 950 fpm canyon on Wind River and we would head in on Tuesday.